Another shot from the slopes during February’s trip to Telluride, Colorado. Riding up the Plunge lift one afternoon, the light was creating some striking definition of the Mammoth mogul run. I didn’t have my iPhone out so I was hoping that by the time I skied down and rode back up, the light hadn’t shifted too much. Luckily, the light was perfect and as I was shooting, a lone skier was coming down, making for a near-perfect composition. I hadn’t initially thought of it as a black and white shot but as I played around with it in PhotoToaster, the deep troughs of the bumps made it a no-brainer. Definitely one of my all-time favourite shots. Taken in Telluride, Colorado (top of lift 5, Polar Queen, for ski bums). I was struck by the symmetry of rusted tin roof, the snow and the fir trees. Taken with iPhone 6 and messed with PhotoToaster and Snapseed to bring out some drama in the sky. 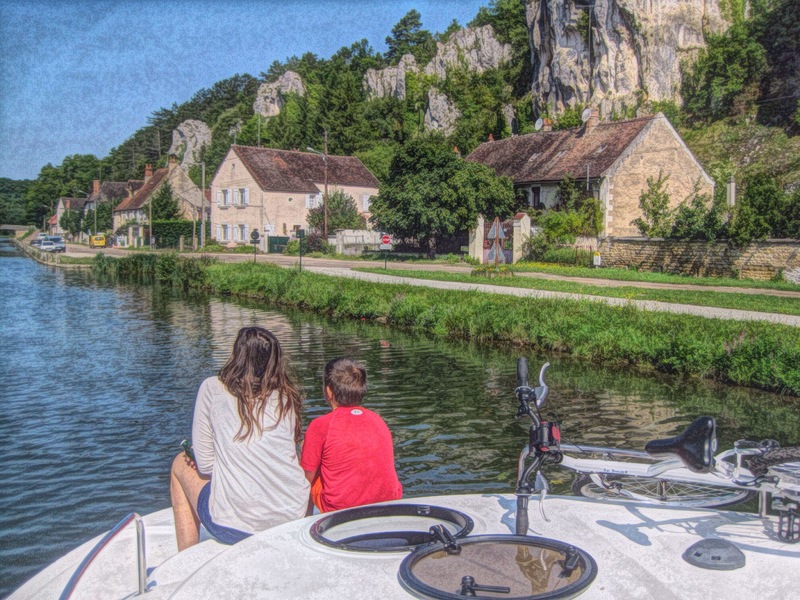 This shot of my kids sums up the beauty and peacefulness of a family holiday last summer, cruising the Nivernais Canal in the Bourgogne, France. Taken with iPhone 5 and given an artistic effect using Painteresque and Image Blender. A random selection of crowd and local flavour shots from the FIFA World Cup in Brazil this summer. My son Toby (aged 11) and I spent three weeks watching games in Sao Paulo, Rio de Janeiro, Salvador and Belo Horizonte. Wonderful people, great atmosphere – and not a bad father-son bonding experience either! These and the other Brazil photos in the previous post were shot on a pocket Canon Powershot SD1200 IS, iPhone 5 and iPod Touch. England fans in full voice against Uruguay in Sao Paulo. My son Toby awaits the arrival of the England and Uruguay teams, Sao Paulo. Wheelchair fans watching France v Germany, World Cup quarter-final at the Maracana Stadium, Rio de Janeiro. Germany 1 France 0 at the Maracana. Beach soccer on Copacabana Beach, Rio de Janeiro. Brazilian mohican at England v Costa Rica, Belo Horizonte. Brazilian fans brought Prince Harry masks to take photos with England supporters. You’re never too far from a Coca-Cola logo at a FIFA World Cup. Senior Brazilian fans show their colours. As expected, not all Brazilians were happy with the cost of the tournament.